The Farm Hub offers winter CSAs with strawberries on the list. At this time of year a fresh strawberry usually travels thousands of miles before finding its way to Island grocery stores. Recently the journey has become much shorter, just a quick drive to the middle of the Island where the Island Grown Initiative’s Farm Hub is growing fresh fruit and greens all year long at Thimble Farm. 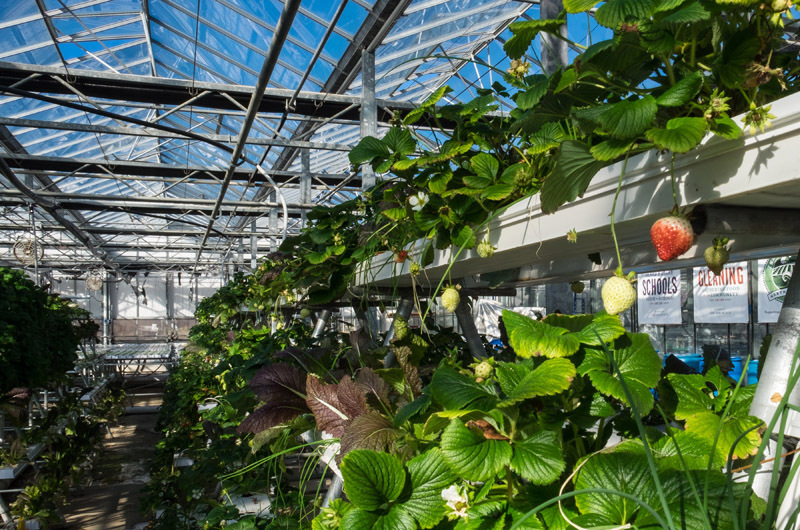 The food is being grown in glass greenhouses that cover nearly an acre in size, where red-veined sorrel stretches skyward and a jungle of vines hold clusters of marble-sized cherry tomatoes. Lettuce, red mustard and other micro greens flourish. IGI took over Thimble Farm in 2012 with help from donations by farm owner Eric Grubman, a seasonal resident of Katama, and Allan and Shelley Holt, seasonal residents of Chilmark. 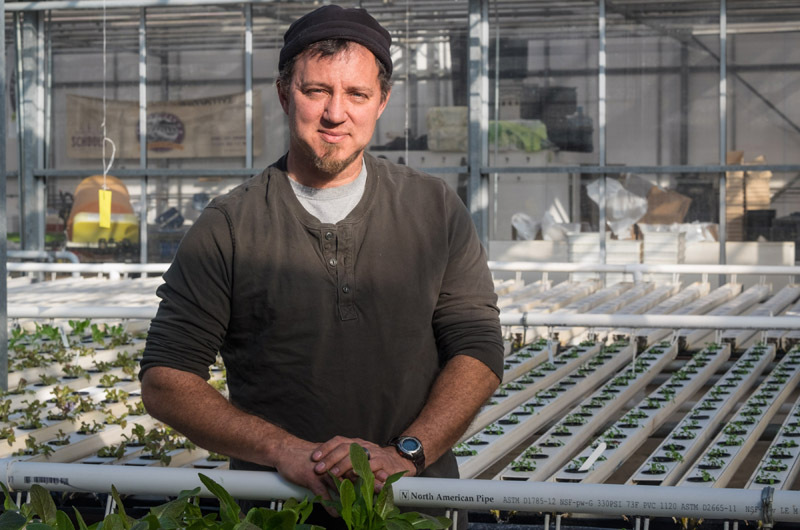 Keith Wilda was hired as farm manager, and is now program leader for the Island Grown Farm Hub, a farming and educational network operating out of Thimble Farm. The sprawling greenhouses, formerly the center of Bud and Patricia Moscow’s hydroponic tomato operation at Thimble Farm in the 1980s and 1990s, had fallen into disuse when IGI took over the operation. Mr. Wilda said about only about four per cent of food consumed on the Island is grown here. 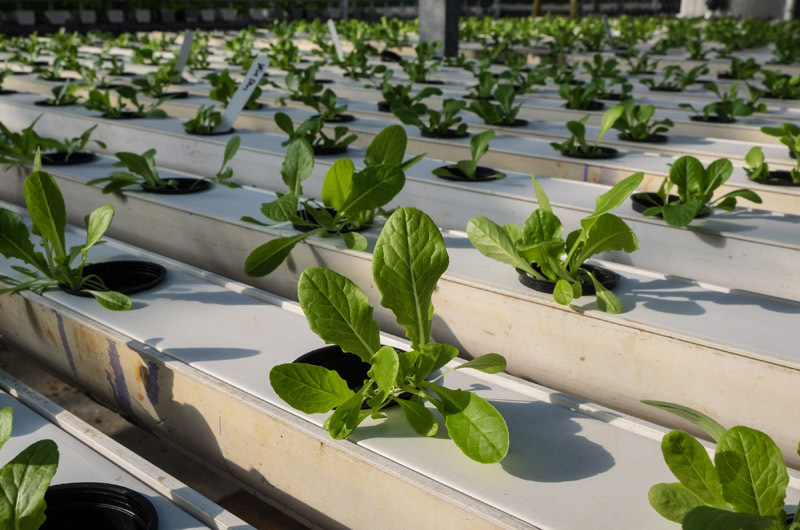 Because of vertical growing space, the greenhouse model can grow eight times the amount of produce that an equal square footage of soil can. It also uses 90 per cent less water, he said, thanks to a recirculating aquaponic system. Water from a stock of rainbow trout is filtered and pumped through the produce and brought back to the fish. Right now the greenhouse complex is about 85 per cent built out with plans to finish the fish system this year. A section of the greenhouse will be leased to farmers. Established as a nonprofit farm resource, the Farm Hub will not compete with other farmers, Mr. Wilda said. The aim of the winter projects is to create models for other Island farmers who may wish to extend their season. “This is here for education, what we grow for food is extra,” said Mr. Wilda. The extra goes a long way. Currently the Farm Hub hosts a winter community-supported agriculture program (CSA), now in its second year, with room for 40 participants. There are full shares (26 weekly pickups) or half shares (13 weekly pickups), extending from November to the end of April. Boxes of produce change weekly and are distributed at the farm on Thursday, Friday and Saturday. After the CSA boxes are filled, the Farm Hub begins packing greens to sell to Island public schools for salads. Both the Martha’s Vineyard Public Charter School and the up-Island regional school district buy winter-grown greens from the hub. The high school also plans to stock their new salad bar with Farm Hub greens. Because the hub is a nonprofit, it can sell the greens to the schools at a 40 per cent discount, said Mr. Wilda. After school lunch orders have been filled, the staff packs pea shoots for Island grocery stores, a few year-round restaurants and some off-Island distributors. About 30 per cent of the produce goes into the community through the CSA and schools, while 30 per cent goes to on-Island markets and 30 per cent goes to off-Island markets. The Farm Hub will also be hosting a farm stand beginning March 1 and lasting through mid-May. It will be open from 9 a.m. to 4 p.m. from Monday to Saturday. Chefs recognize it as a resource and will email Mr. Wilda with requests, he said. Last year they grew ginger in the greenhouse; this year they are growing wasabi root and red-veined sorrel. Mr. Wilda reiterated that the Farm Hub model is for education and will not operate as competition for Island farmers. Though a greenhouse of this scale would cost an estimated $2 million to build today, the model they provide will work in a greenhouse of any size, he said. “It shows producers options for how a greenhouse can extend your season,” he said. Sign up for Island Grown Initiative’s newsletter at islandgrown.org for the latest on winter produce opportunities. Great story. Well written! Thanks for including this in your paper. I look forward to saving the print version of this story. I also enjoy the crossword puzzle. A great example of sustainable local farming. Congratulations Keith! Great project Keith - you did "something fishy" for so long out here in the western hinterlands of the state that the island and education component of this IG effort must be very satisfying. Looking forward to hearing how the scaling up goes, as well as the learning bridges with the local farmers. I applaud IGI and Keith Wilda for the dedication and hard work it takes to bring such a wonderful "gift" to our Island. Thank you. Thank you. This is a tremendous and impressive endeavor. My father, Bud Moskow, would I think, be delighted to learn that Thimble Farm is being used and developed with the intent and thoughtfulness through which he wished to preserve and have this property thrive. Thank you for your knowledge, insight, generosity of spirit, and dedication.